The Wild Duck Chase by Martin J. Smith. The Animal Planet documentary is an Emmy consideration. Martin J. Smith, of Granby will be giving a talk at the Fraser Historic Church on Friday, Feb. 17 about his nonfiction book, The Wild Duck Chase. It is a book about the Federal Duck Stamp Contest and the strange and wonderful world of competitive duck painting. Smith is veteran journalist, published author and magazine editor. Last fall he gave a talk in Grand Lake about his mystery-thriller, Combustion. Around the same time as his talk, the movie about the Federal Duck Stamp Contest was released: Million Dollar Duck. 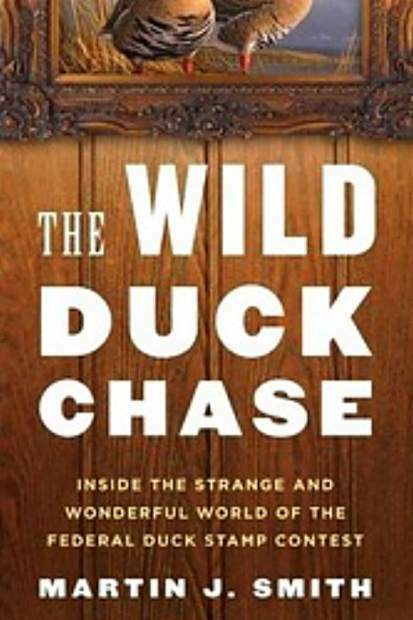 The book, The Wild Duck Chase was published in 2012 and the movie, Million Dollar Duck came out and aired on Animal Planet in 2016. As part of his talk on Feb. 17, Smith will discuss the Federal Duck Stamp Contest program and why it is endangered. “The program is supported by hunters and the number of hunters is declining,” he said. This entire program could be gone with the stroke of a pen. As part of his talk, Smith will explain how hunters who pay the tax help conserve wetlands and how valuable hunters are to the program. For the people who love to bird watch and visit conservation areas, they can thank a hunter. Birders and hunters generally don’t like each other but because of the book and the film, they now are friendlier, said Smith. He will also talk about the controversies of the competitive duck painting world including the pop culture references in the movie, Fargo to the program.